America sold out again by another elite puppet President! The deal struck between the pharmaceutical lobby, the White House and Senate Democrats has drastically improved Big Pharma’s expected profits, a private industry report finds. IMS Health, a company that supplies the pharmaceutical companies with sales data, predicts that new health reform legislation — combined with a projected upswing in the economy — will result in a net gain of more than $137 billion in total market sales over the next four years. The new assessment was contained in document obtained by the Huffington Post. Back in March, that same firm projected a compound annual growth rate of -0.1 percent in the period of 2008 through 2013. In October, with the general outlines of health care reform clearly in place, it revised that number to a positive 3.5 percent for over the same period. What happened in those seven months? The economy started looking up, for one, as did the overall prospects of health care reform. But the industry also won a major lobbying victory. PhRMA, the lobby entity for the industry’s heavy hitters, reached a secret deal with the White House and the Senate Finance Committee in June. As detailed in a memo first published by The Huffington Post, the Obama administration agreed to oppose congressional efforts to use government leverage to bargain for lower drug prices. The White House also agreed not to shift some drugs from Medicare Part B to Medicare Part D, which would have cost the industry billions in reduced reimbursements. All this in exchange for $80 billion over ten years to help push for reform. The Senate version of the healthcare bill still conforms to the deal (that the White House has still never officially confirmed). The House bill is in the same ballpark, although it would cost Big Pharma an extra $14 billion. “Branded drug price increases are expected to continue,” the firm concluded, before citing the specific reforms of the PhRMA deal. America’s Affordable Health Choices Act of 2009 (HR 3200) has proposed several changes to the Medicare Part D program that would impact federal spending. Firstly, it would create a new rebate program that would require manufacturers of brand-name drugs to pay the federal government a rebate equaling 15% of the average manufacturer price. The finer details of the rebate will be determined as the reform legislation develops. Secondly, it would phase out the doughnut hole by simultaneously extending the benefits initial coverage limit and lowering the catastrophe threshold at specified rates leading to removal of the doughnut hole by 2022. Thirdly, as the doughnut hole is being phased out drug makers would be required to provide beneficiaries who are not eligible for the low-income subsidiary programme with a 50% discount on their spending in the doughnut hole for covered branded drugs. This initiative could create new business for pharmaceutical companies and also give seniors a price break, but only if they were paying full price on the brand product in the first instance. For pharmaceutical companies the agreement will lead to a loss if the senior was paying full price, but a win if the senior was not buying brand products at all. 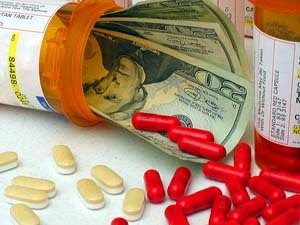 By making branded drugs in the doughnut hole more affordable patients may be able to afford to continue with treatment. Health reform, as currently envisioned, wouldn’t merely bring coverage to the uninsured. It would also fill in the “donut hole” in Medicare Part D–the gap in coverage that leaves beneficiaries with serious health problems paying for hundred if not thousands of dollars in out-of-pocket prescription costs.In addition, because it will take several years to close the donut hole, reform relies on voluntary discounts from the pharmaceutical industry to make drugs more affordable in the intervening years. But those discounts would apply only to name-brand drugs, not generics. Put it all together, and you have more demand for name-brand drugs. The structure of health care reform, as IMS goes on to note, will have benefits for the federal government, which could save an estimated $30 billion from 2010 through 2019. Patients, meanwhile, would be paying higher premiums — roughly five percent more by 2011 — in return for what the report calls greater “protection against incurring higher drug costs.” The real beneficiaries of reform, however, would evidently be the pharmaceutical industry. IMS’s conclusions are one of the clearest affirmations yet of various media reports that PhRMA is coming out of its negotiations with the White House and the Senate as a big winner — though, as Cohn notes, the numbers IMS uses are simply projections and they may not necessarily bear out. At the time, PhRMA was making the case that the $80 billion it was offering for reform was a major concession to the White House and Senate Dems. Compared to the new numbers, however, it doesn’t look like such a big concession anymore.